Teresita Fernández, Autumn (. . . Nothing Personal), 2018. Image: Courtesy Teresita Fernández Studio. © 2017 Teresita Fernández. This event was recorded and is available via the Harvard Art Museums Archives. 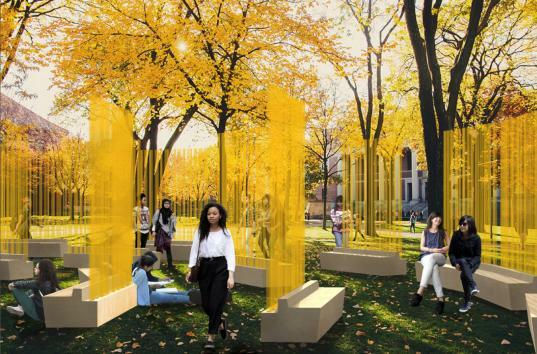 In connection with her public installation in Harvard Yard this fall, Autumn (. . . Nothing Personal), artist Teresita Fernández will discuss her practice and ongoing research for this major commission by the Harvard University Committee on the Arts. On view August 27 through October 1, 2018, Autumn (. . . Nothing Personal) is a site-specific work built for Tercentenary Theatre in Harvard Yard. The title references James Baldwin’s 1964 text Nothing Personal, which was published as a collaborative book with photographer Richard Avedon at the height of the civil rights movement. Fernández’s project centers Baldwin’s text as a collective reading and asks members of the Harvard and local communities to use the sculpture as a social space to read, perform, gather, and debate. Best known for her prominent public installations, Fernández has produced site-specific commissions for Madison Square Park, New York; Grace Farms, New Canaan, Connecticut; Aspen Art Museum; Blanton Museum of Art at the University of Texas, Austin; and Olympic Sculpture Park, Seattle. Her work is featured in numerous international public and private collections, including the Harvard Art Museums; Museum of Fine Arts, Boston; Museum of Modern Art, New York; Pérez Art Museum, Miami; San Francisco Museum of Modern Art; and Walker Art Center, Minneapolis. Appointed by President Barack Obama, Fernández was the first Latina to serve on the U.S. Commission of Fine Arts, a 100-year-old federal panel that advises the president and Congress on national matters of design and aesthetics. She was a 2005 MacArthur Foundation Fellow and has received numerous awards, including the Aspen Award for Art in 2013, the 2003 Guggenheim Fellowship, and the Louis Comfort Tiffany Biennial Award in 1999. In 2017, Fernández was named a National Academician by the National Academy Museum and School, New York. She lives and works in Brooklyn, New York. Presented by the Harvard Art Museums in partnership with the Harvard University Committee on the Arts. Autumn (. . . Nothing Personal) is a commission of the Harvard University Committee on the Arts and was made possible with the support of the Johnson-Kulukundis Family President’s Fund for Arts at Harvard University.